The Plus/4 is a Commodore home computer, which was produced and sold from 1984 to 1986. The computer has got a compact, flat plastic casing and a fully-fledged keyboard. The cursor keys and function keys were made of rubber. 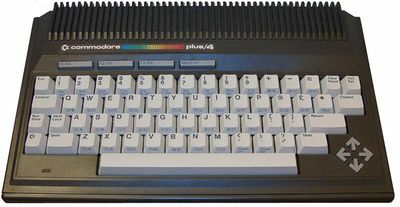 The Plus/4 is similar to the C16 and C116 and belongs to the Commodore 264 series, which are software compatible between each other. The original price was about $300. Worldwide have been produced about 827.000 units, about 286.500 alone in Germany. Also there was a variant with modified Plus/4 logo (+4=) for the Canadian market and a version for the Hungarian market with additional key stickers of the hungarian characters. Compared to the VIC-20 and C64 the operating system of the Plus/4 contains an advanced BASIC in the version 3.5. The software for the Plus/4 is not compatible to the C64. Same applies to the peripheral devices datasette 1531 and disk drive 1551 and the Plus/4 joysticks. However the datasette and the joysticks could been used via a simple adaptor. Start screen of a Commodore Plus/4. It is interesting, that the Plus/4 was one of the first home computers, which had integrated user software on a ROM-chip. So the Plus/4 contains one of the first office programs. Word processor: Start with F1 +RETURN or SYS1525 (plus <RETURN>). In the Plus/4 software area you can change by using the key combination C= +C and the following input of tw (plus <RETURN>; shortcut for "to Word" ) in the command mode to get back to the word processor. Spreadsheet: Start with F1 +RETURN or SYS1525 (plus <RETURN>), then press C= +C and enter tc (plus <RETURN>; shortcut for "to the Calculator" ) in command mode. Additional graphics option for the spreadsheet, i.e. creation of block- or scatter diagrams with data from the tables. Database: Start with F1 +RETURN or SYS1525 (plus <RETURN>), then press C= +C and enter tf (plus <RETURN>; shortcut for "to File Manager") in the command mode. Important: Before the first use of the database a special file for the database management must be created. The built-in machine code monitor TEDMON is part of the BASIC V3.5. He can ce called with SYS 0 or MONITOR. Power connector (Power; 4-pins, square) for the power supply unit. PSU basically compatible to C64, but uses different (square) connector. CPU: MOS 7501 or 8501 with 0.885/1.78MHz Clock frequency (controlled by TED) - average approx. 1.1 MHz. Sound: TED 8360 is used as well for sound generation and can create 2 independend voices with tones or sound effects covering 4 octaves (approx. 28 tones without intermediate tones). Keyboard: 67 keys (QWERTY or QWERTZ), with multi-assignments, function key are already predefined. $4000-$FD00 | 16384-64768 | BASIC-RAM begin (if using graphics) ! Color       | Key com-   | Color value  | In program:  | Or by PRINT "control character"
An overview or a modify of the function keys follows through the BASIC-command KEY in direct mode or in programs. After a reset or a reboot are the normally function key configuration active. 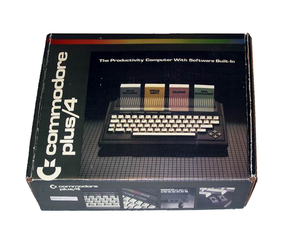 In Germany the Plus/4 was available as single package and later was sold in a bundle.